Samsung’s Galaxy Fold. It unfolds like a butterfly and has a price that stings like the bejesus! Folding touchscreen smartphones are coming very soon, whether you want them or not. Samsung has announced a hard April 26th release date for its Galaxy Fold, while Huawei is only committing to bring its folding Mate X to market sometime in 2019. We know comparatively little about how both these experimental devices will actually perform but we do know that they will both be eye-wateringly expensive. The Galaxy Fold has been priced at US$1,980 and the Mate X at $2,600. These first two iterations, from Samsung and Huawei, of consumer devices with folding touchscreens are—on the one hand, over-priced gimmicks aimed at giving expensive bragging rights to well-heeled early adopters and much more besides. They are also aimed at giving expensive bragging rights to their non-U.S. makers and—in the process—showing up how threadbare Apple’s mantle as a preeminent innovator in the smartphone field has become. In a more substantive, geopolitical sense, these first-of-a-kind devices—both designed and manufactured in Asia—show how the United States tech sector is in the process of losing it’s edge in computer engineering and design, the same way that it earlier lost control of the component supply chain. Beyond all that, these two devices represent potentially essential steps on the long road to develop reliable, consumer-friendly, flexible screen technology; a journey which began in the mid-1990s (at least) and has consumed untold billions of dollars in research spending by virtually every major name in computers. Flexible displays are important insomuch as they they will finally break the artificial restriction that has long been imposed on computer design by rigid displays. They will literally return the flexibility to our information devices that was gained two millennia ago by switching from stone and clay tablets to papyrus, sheepskin and finally paper. Over 20 years ago desktop computers ushered in electronic publishing, which had the unforeseen consequence of turning the tables and making full colour offset printing easier and then much more common than the previously easier and cheaper spot colour printing. Ultimately, flexible displays—should they become as cheap and ubiquitous as paper—could do away with full colour offset printing altogether. In the short term, however, I’m hoping that folding, touchscreen smartphones will at least give us back the pleasure and utility of mobile phones that fit comfortably and safely in the pocket. This is something that we lost when the success of Apple’s iPhone in 2007 led to its full touchscreen, slate form-factor being adopted by every mobile phone maker—to the exclusion of other form-factors, including the oh-so practical clamshell. 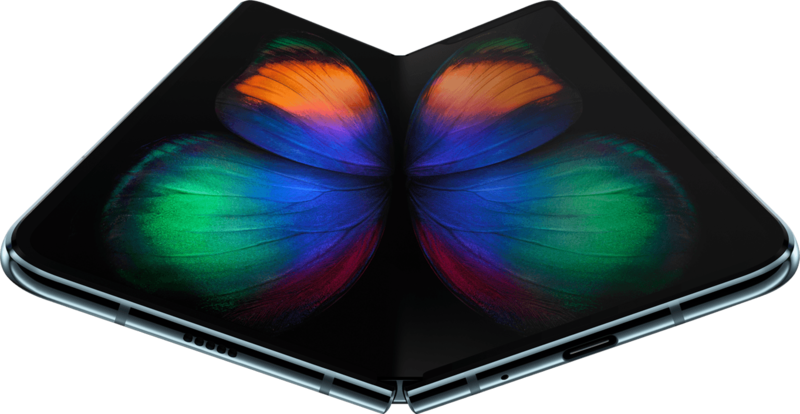 In point of fact, Samsung’s Galaxy Fold is a clamshell design that opens and closes like a book. The “main” 7.3” QXGA+ Dynamic AMOLED display folds together like two pages and the back of the open device become the front and back covers when it is closed, displaying a 4.6” HD+ Super AMOLED “cover” display. The AMOLED display technology used on all Samsung mobile devices and TVs has always been flexible—up to a point—exactly the way a clear piece of paper-thin plastic sheet is flexible. Which is to say, that you can roll it up but if you try to fold the sheet flat on itself it will be permanently creased. 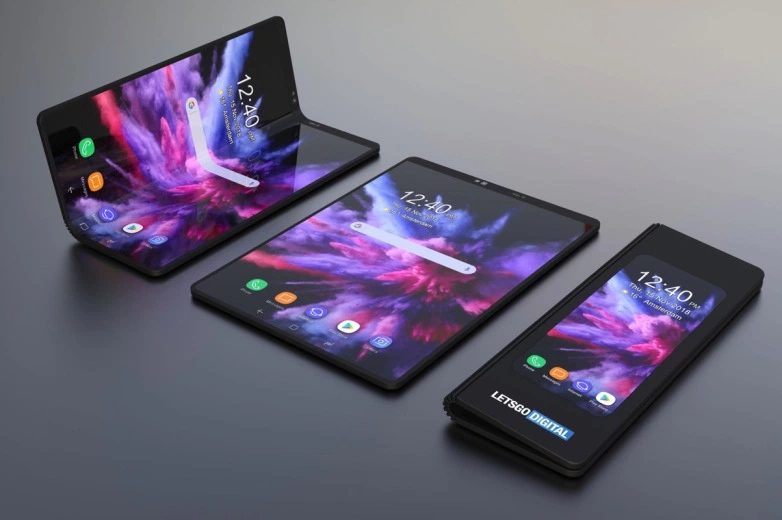 Samsung’s Galaxy Fold is embodies technical aspects from its April 2016 patent for a “flexible device”. To achieve the Galaxy Fold, Samsung has had to come up with a flexible AMOLED screen capable of holding a tremendously (almost unheard of) tight minimum bend radius before being damaged—and of doing it not just once but (as Samsung says) hundreds of thousands of times. At the same time, the Galaxy Fold embodies a spine hinge that allows the screen to actually roll, rather than fold, with the result that the device closes like a binder, rather than a leaflet. Much of this was revealed in Samsung’s 2016 “flexible device” patent. Huawei’s Mate X also folds like a book but, contrary to the Galaxy Fold, the Mate X’s screen ends up being on the outside of the closed device—like the dust jacket of a hardcover. So it’s more of a reverse clamshell. 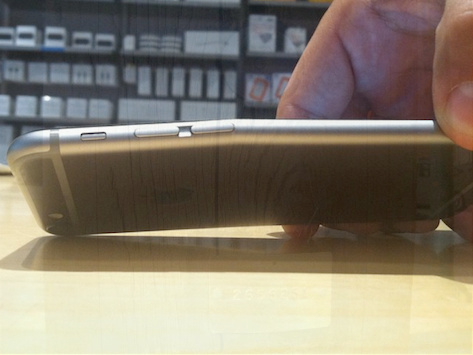 When you realize that the challenge of a folding touchscreen is the screen’s bend radius (a.k.a. rolling radius), you can see how Huawei’s approach of putting the screen on the outside of the folding device allows for the maximum-possible bend radius for a given device thickness. However, this does nothing to protect the plastic screen, which must be more prone to abrasion, given that it does not have the benefit of anything like Gorilla Glass protection. One possible problem with both Samsung’s and Huawei’s folding smartphones is the odd, squarish aspect ratio that both of them have when unfolded. This is arguably bad for cinematic video. What seems to be needed is the addition of a “gatefold”. However, such a”three-fold” device would only be remotely feasible with Samsung’s design but the added thickness would be considerable. Both devices are already very thick by flagship phone standards. The Galaxy Fold is reportedly 12.8mm thick, while the Mate X is 11mm. Compare this to the Samsung S8 (7.9mm) and the Huawei P20 (7.65mm), as well as the iPhone X (7.7mm). But it remains to be seen whether it is consumers who are driving manufacturers to make thinner phones, or phone manufacturers who want consumers to care about thinness in lieu of more substantive new features. While everyone in the tech sector will be watching how these two first generation folding smartphones are received—especially phone makers like Lenovo and LG, that have talked about releasing their own “folders”—the real measure, I believe, will not be how they perform or how they sell but rather, what better folding smartphones they lead to and how quickly. 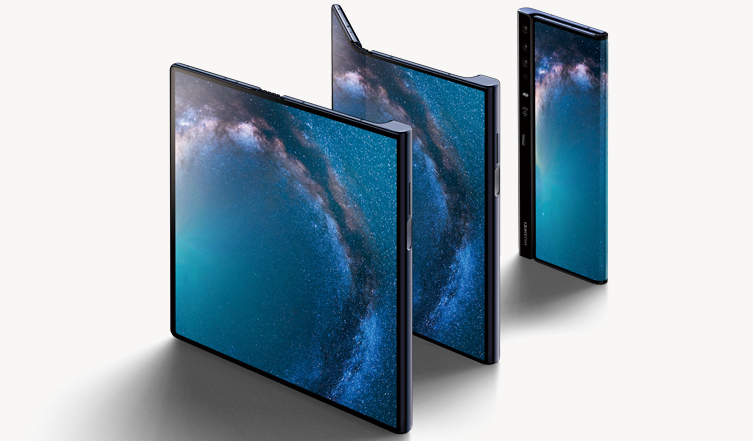 We will be able to judge 2019’s Galaxy Fold and the Mate X as failures if, in five years time, they do not look hopelessly crude and obsolete compared to the much more sophisticated folding phones of 2024. Click the images to enlarge them. For the next decade, I will continue to buy clothes with very wide pockets.